A to Z of Wildlife: Y is for… Yellowfin Tuna! Yellowfin Tuna can grow to almost 14 feet and so are some of the biggest fish in the world. They are shaped like torpedoes which makes them very streamlined and able to swim very fast. They can swim over 6,250 miles to look for food at speeds reaching 43 miles per hour, often in big groups called schools. Yellowfin are highly migratory and are found throughout the Pacific, Atlantic and Indian Oceans. Yellowfin tend to school by size with other yellowfin as well as with other species. 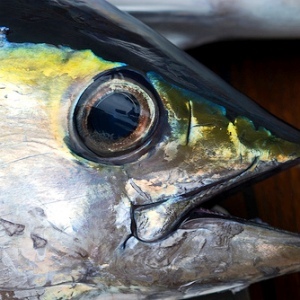 Juvenile yellowfin, for example, form schools with skipjack tuna and juvenile bigeye tuna in shallow waters! Wild Challenge – The fastest humans can run 100 metres in under 10 seconds – how long would it take you?